While everything about a new life is sweet and wonderful, the task of putting away soiled diapers is decidedly not. With multiple diaper changes every day, most parents are on the lookout for the best diaper pails that not only make sure that what goes in the bin stays there but also keep the surroundings free from the telltale smells that accompany a diaper. While any bin can act as a receptacle for dirty diapers, it is no fun to deal with the process of immediate disposal. Nor do you want the entire nursery, and quite possibly your whole house, to be filled with the odor of a diaper. A dedicated diaper pail is not only a worthy addition to your child’s room; it is more than necessary. We bring you a roundup of the diaper trash cans on the market that can take care of that one particular aspect of child rearing that you most assuredly don’t want to think too long about. When it comes to diaper pails that use regular trash bags, this one’s a winner because it does not require you to shop for specific refills. Its steel exterior ensures longevity, as does its incredible simplicity. You can use the pail to dispose of both cloth and other kinds of diapers. The diaper bin comes with a childproof lock system which can come as a boon for homes with toddlers. After extended use over time, rust and mold may develop if the pail is not cleaned regularly. Why Will You Like This Product? 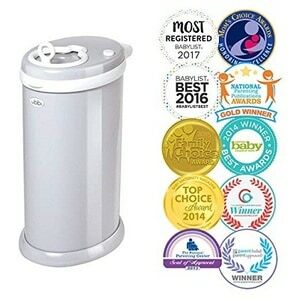 With nine awards in its kitty, most diaper pail reviews rave about the product, its sliding lid, rubber edges and optimum size. It also comes in a wide range of colors! This cost-effective diaper pail is great for busy parents and promises only a 20-second-long refill change — a fact that comes as a relief to parents who already have their hands full with a little one. It’s odor-free and also comes with a large mouth to make disposals easier. The diaper bin lid shuts quietly after you drop off your waste. You can remove the diaper insert and use it long after your child has grown up as a plain dustbin. You need to buy a specific set of branded refills to line the bins with. The baby diaper pail promises to be hands-free. This means, you need not to bend over to squish the soiled diaper through, you only need to step on the pedal and drop it inside. If you are looking for a diaper trash can that looks sleek and gives off a modern aesthetic, then this is the find for you. Distinctly odor-free, the pail is engineered to involve the least amount of labor in soiled diaper disposal. Its self-sealing system makes sure your diaper bag is sealed shut after you place it in the bin. Most reviews marvel at the fact that there is no odor even if the bin is not emptied for multiple days. The foot pedal only works to open the bin. You have to close the lid with your hand. It is value for money, and so are its refills, which come in the continuous ring and snap-and-seal formats. What’s more? For every pail you buy, the company plants a tree! A tall, sleek and ergonomic design ensures that your nursery retains its neat look with what is quite possibly one of the best Diaper Genies in the market. The diaper bin is fitted with carbon filters that absorb and prevent unpleasant smells from escaping the pail, fortifying a strong odor-control system. Not only is it airtight, emptying it is no hassle at all, thanks to a front-tilt bin that leaves you with no extra work other than just lifting out the bag. You will not need to bend to open the lid, thanks to the foot pedal. The diaper trash can requires no assembling and comes pre-fitted with a refill. 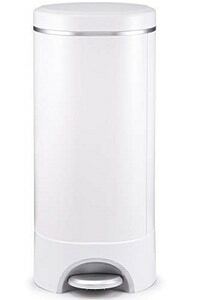 Compared to some of the best Diaper Genie products, it can hold fewer diapers. Does not work for cloth diapers as the trash bag is meant to be twisted off into a knot to facilitate disposal. 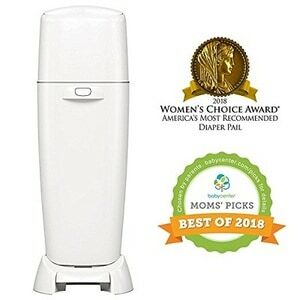 Simply because so many others have, the product received the Women’s Choice Award 2018 for America’s most recommended diaper pail and was among the Baby Center Mom’s Picks for 2018. Why do we recommend these Products? 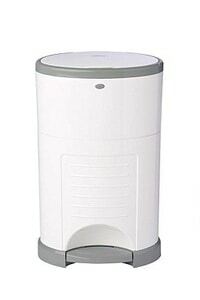 There is a lot to consider while choosing a baby diaper pail. How big does it need to be? Does its color complement the scheme of your child’s nursery? Should you browse through diaper pails that use regular trash bags or invest in refills? Will you be getting the maximum use out of it at this stage of your parenthood? Or is it going to simply add to the list of things you need to buy for your child? Of course, what comes first is your ease. A happy parent makes for a happy child. The best pails available honor this adage and make sure you never have to compromise with the idea of a clean, neat and fuss-free day with your precious little one. Momnkids is a participant in the Amazon Services LLC Associates Program, an affiliate advertising program designed to provide a means for sites to earn advertising fees by advertising and linking to amazon.com. Copyright © 2018 by Mom N Kids.